FitnessSyncer for IOS allows you to synchronize your HealthKit data (including Apple Health, Apple Workout, Apple Watch, and many other applications) with the FitnessSyncer Platform where you can see in our Dashboard or Stream, publish it to one of our destinations, or publish cloud data into HealthKit. 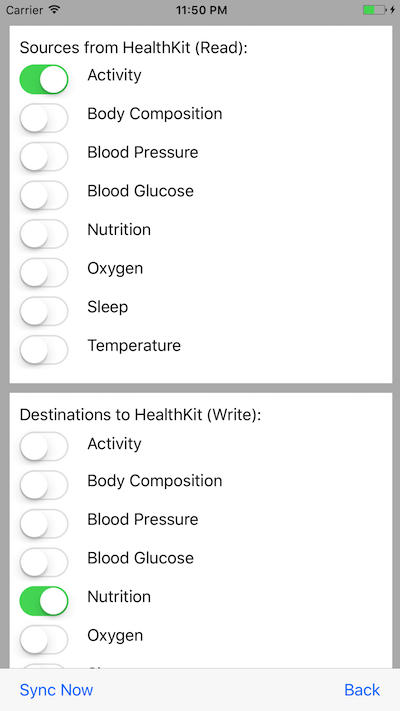 After logging into FitnessSyncer for IOS, navigate to the Apple HealthKit section by clicking the Apple Health icon from the Sources and Destinations tab. Select what type of data you wish to access and as you change these access types, you may be asked to grant permissions to FitnessSyncer to read or write this data. As with our cloud offering, you must accept all requested permissions. Once that the permissions are granted, you can then use the “Sync Now” button which will synchronize the data with FitnessSyncer. To use sources or destinations beyond Apple Health, you will need to navigate back to the Sources and Destination tab. You should note that non-Pro users are limited to the number of sources and destinations tasks they have within their account and each of these sources count towards this. Also, advanced features such as filters are not available within the app, however, are available on FitnessSyncer.com. If you wish to revisit the permissions you have granted to FitnessSyncer, you should open the Apple Health app, go to Sources, select FitnessSyncer and adjust the permissions appropriately. FitnessSyncer for IOS will either sync your Apple HealthKit data when you press the “Sync Now” button or if you enable Standard Syncs in the FitnessSyncer Health Kit settings, we will periodically synchronize. To disable Standard Syncs, you would do so from the Settings. FitnessSyncer Pro users can schedule the periodic syncs by scheduling a Refresh Source Destination Task. When creating a new Source or Destination, if you select Apple HealthKit as the provider, we will automatically redirect you to the Apple HealthKit global properties, not with a brand new task. When I select a Data Type and accept the permissions, the switch turns off. Why? Usually this is because that one or more of the required permissions were not accepted. In Apple Health, go to Sources and select FitnessSyncer and ensure that all of the permissions mentioned there are switched on. If you are still experiencing issues, please contact us. Can I get the maps from my activities? If you are running IOS 11 and FitnessSyncer for IOS 2.0.5 or greater, you can read and write maps. All of my data uploaded from FitnessSyncer is no longer available in Apple Health; why? If you have uninstalled FitnessSyncer, IOS will ask you whether you wish to delete all of the data from Apple Health at that time. More than likely, this is the cause. If you wish to re-upload the data, you will need to log into FitnessSyncer.com, go to my Account and click Reset button for all of your Apple Health destinations and then you can resynchronize the data to Apple Health. I have updated FitnessSyncer for IOS and now it hangs during synchronization; how can I resolve this? If that option is not available, please contact us. Go to Settings, Apple Health, and tap Standard Synchronization. You may need to accept a permission. Within a few moments, you should see it synchronize. If this is not working, please open IOS’s Settings, choose FitnessSyncer and ensure that the Notification feature is enabled. We will not prompt you for any notifications, but this is how our service automatically synchronizes. If you are still experiencing issues and have recently Forced Closed FitnessSyncer for IOS, we recommend that you restart your phone and try again. If you are still experiencing issues after all that, please contact us.